Arugula is a pungent, peppery leafy green native to the Mediterranean. It is in the Brassica or crucifer family, which also contains vegetables such as broccoli, kale, radishes, and cabbage, but is perhaps less common in the edible garden landscape. Although arugula is typically considered a fall vegetable, it can be seeded all year long with a little bit of protection from extreme cold or heat. Arugula is an easy green to grow and adds pungent, peppery flavor to salads, pizzas, and many other dishes. Photo by Turkey Hill Farm. Matter of fact, you can plant arugula every few weeks year-round to enjoy young tender leaves anytime. 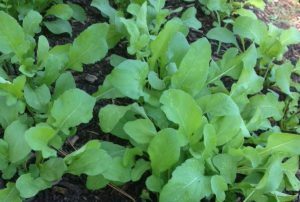 Since arugula has a compact root system, sow seeds one to two inches apart, thin out young whole plants as they fill in, and add them to salads for some extra dinner pizazz. Once plants are four to six inches apart, begin to harvest just arugula leaves, leaving the plants to grow taller in height. Leaves make great toppings on a sandwich or pizza, can be tossed in pasta just before serving, or can be steamed, stir-fried, or pureed and added to a plethora of dishes. Although arugula is not as flashy as many of its fall garden counterparts, it is often the easiest to manage and last to get pest and disease problems. While your lettuce is attacked by slugs, kale crawling with aphids, and cabbage chewed up by armyworms, arugula often shines unblemished. And in late fall and winter, arugula will only need cold protection if we have a hard freeze (temperatures below 28 degrees for more than four hours). In these cases, cover your plants with frost cloth, bed sheets, or simply buckets, if your arugula patch is small. Just remember to secure your cover to the ground, such as using bricks to pin the cloth, to prevent gaps for air to escape. If done correctly, you can raise air temperatures eight degrees. So be brave, clear some space in your garden plot, and give this spicy cabbage cousin a try!